How Do You Solve a Problem Like a Pumpkin? With only a few days to go before Glow at the Gardens™, we are eagerly awaiting the nights that our pumpkin sculptures will come to life. And we’re not the only ones: jack-o-lantern events are becoming increasingly popular, popping up in more and more cities all over the country. 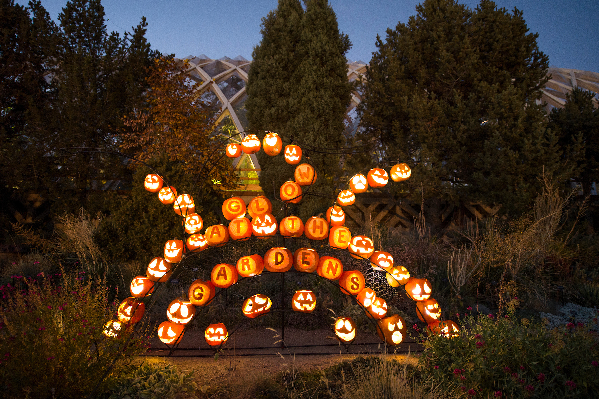 Most of these events, however, share one common trait: their elaborate sculptures are created using fake pumpkins, or “funkins.” But not Denver Botanic Gardens! For each night of the event, every pumpkin we use is the real deal. We’re proud of our pumpkin realness, but we must admit, they do present us with some interesting challenges. It’s harder than you may think to find 3,000 pumpkins that are about the same size, are fully ripe at the same time, and can be delivered to the middle of Denver during peak pumpkin harvest season. Each year of Glow at the Gardens, we’ve worked with local growers to stake our claim on pumpkins early in the summer. Then we just cross our fingers and hope that hail storms, insects, bears and drought will let them reach maturity by the time we need them! Once the pumpkins arrive onsite, we work quickly to store them in areas that offer them some protection against the weather. Since October in Colorado can feature wild swings in temperature and precipitation, we want to be ready for anything. However, even if weather wasn’t a factor, finding places to store 75 pallets of pumpkins is no small feat during what has become one of the busiest seasons at the Gardens. While funkins can be carved weeks, months, even years in advance and stored for future use, carving real pumpkins is a different ballgame. To make sure the pumpkins will still be in good condition for two nights of the event, our team only has two and a half days to get all the pumpkins washed, gutted, carved and displayed. Harvesting fresh pumpkins means you never quite know what you’re going to get. If pumpkins are too green, they are too hard to cut; if they are too ripe, they turn to mush as soon as they are carved. Also, designing armatures to hold pumpkins can be challenging when you don’t know exactly what shape will show up on delivery day. Because real pumpkins are far heavier than foam ones, we must carefully think through the structural integrity of the armatures that form the base of each sculpture. The last thing we want to see is a sculpture with pumpkins tumbling off of it! Those little creatures just love October at York Street. It seems that there is nothing more enticing to our squirrels than the exposed flesh of freshly carved jack-o-lanterns! We frequently have to replace jack-o-lanterns just hours after they have been displayed because, well, the squirrels gnaw and nibble through their faces. Like a bouquet of fresh flowers, a pumpkin sculpture is at its prime for just a couple of days before nature takes its toll. As the jack-o-lanterns begin to shrivel and decay, the designs that have been carved into them morph and fade. Our goal for Glow at the Gardens is not only to provide an incredible Halloween experience, but also to push the very boundaries of pumpkin carving. Could we have more displays if we used funkins? Sure. Would we be able to carve them farther in advance and reduce the hustle and bustle of the days leading up to the event? Absolutely. But the Gardens’ mission is to connect people with plants: what better way to do so than by designing and carving the fruit of the most popular plant of the season? Glow at the Gardens is open October 17, 18, 23, 24 and 25. Tickets are extremely limited and are expected to sell out. Purchase tickets online or at the Bonfils-Stanton Visitor Center at 1007 York Street.